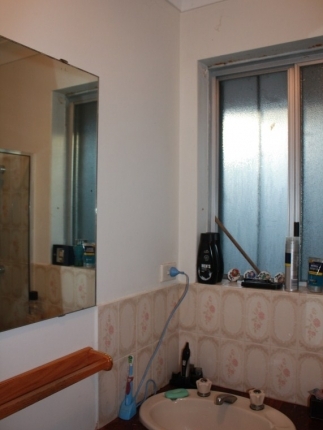 Over the long weekend Mr Nerd and I finally started gutting our horrible 70s ensuite. 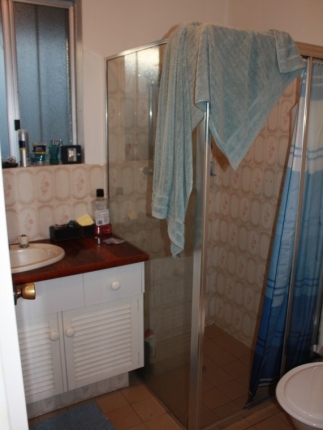 We had been talking about renovating the ensuite for ages, and we were sitting on the bed staring at it and finally decided to start knocking it out. 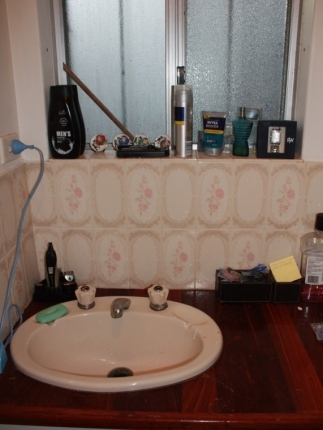 Within ten minutes the ensuite was a mess of porcelain. I was over the moon. 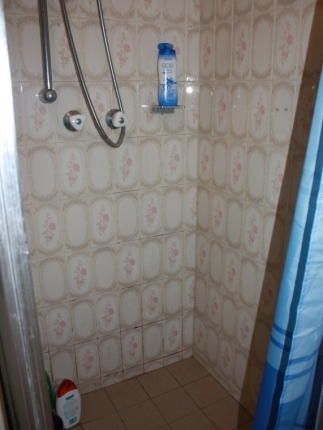 I hate this ensuite and everything about it – its size (or lack thereof), its brown granny bathroom tiles with pink roses, the weird musky smell that’s been there since we moved in, no matter how much we’ve scrubbed, as if an old lady had died in the bathroom, turned into a ghost and announced she refuses to leave the room. Would you like to see pics? 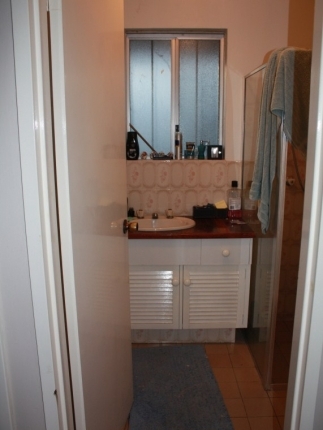 I'm sorry it was so hard to photograph this room - it is seriously TINY, just 1.8m by 1.8m. We debated for ages whether to knock out the wall that the mirror is mounted onto - on the other side of that wall is our walk-in robe - and using space from the robe to enlarge the bathroom. But we decided not to because a) this is not going to be our 'forever' house and so we don't want to spend too much on it and b) our master bedroom is already quite small, so eating into the walk-in robe space would have meant putting built-in robes in the bedroom and chewing up valuable bedroom floor area. I have ALWAYS wanted to gut a bathroom. I think because it just seemed like fun to go mental with a hammer and smash stuff up like Hulk. The reality? I thought I could whack a hammer on the tile and it would drop off the wall, easy-peasy. Yeah, not the case. Some of the tiles came away really easily with a chisel, others were almost impossible to remove with brute force and it was really hard work – we had to visit Bunnings to pick up a power tool. 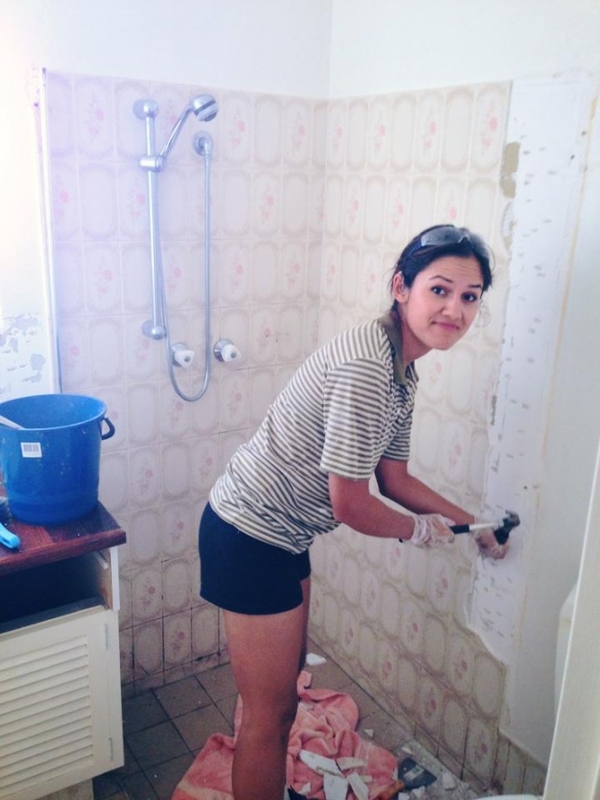 By the way, if you are ever thinking of gutting a bathroom, we used a chisel, a hammer and then bought an Ozito Rotary Hammer Drill ($99) drill to get the tiles off. 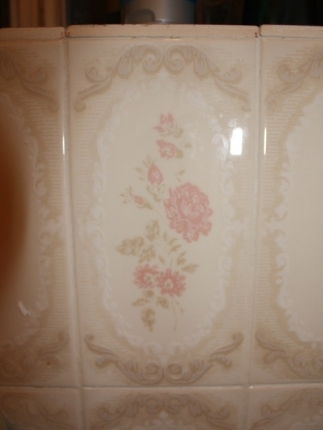 There was something deliciously satisfying about smashing up those creepy brown tiles with pink roses on them. I hated them so much for so long! This is what the bathroom looks like now post-smash. And here I am starting to gut the bathroom. I’m not sure why I seem to enjoy sharing so many incredibly unattractive photos of myself with you guys lately. I look like an idiot here. I really don’t look like this all the time. At least I hope I don’t. 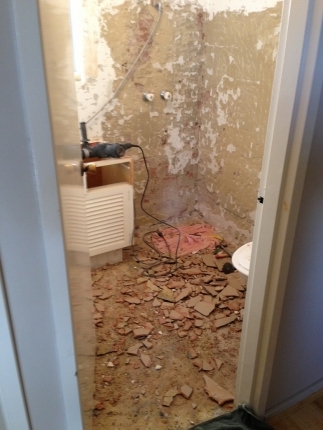 I think this photo makes it look like I gutted the bathroom all by myself, but really Mr Nerd did most of it. I however, did sweep up and put tiles in the bin. I think wetroom with all white tiles, change door to a sliding door, maybe move basin to corner (if it will fit with the door open), close coupled loo and hobless shower ? simple and bright if not a bit boring . Bev, thank you! I love your ideas. 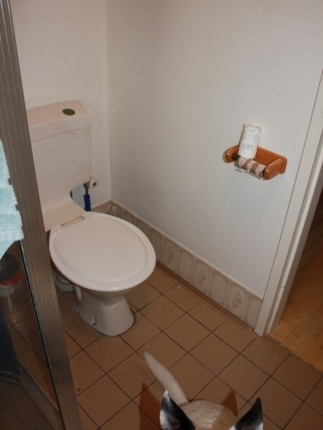 We didn't know what a closed coupled loo was so we had to Google it - perfect as the whole bathroom is just 1.8m x 1.8m. We don't want to spend too much as we are eventually planning to move and rent this house out and agree that it's best to stick to a really simple colour scheme - we are going white tiled walls, light-coloured travertine floor, light benchtop. The interior design nut in me wants to do an elaborate tiled splashback and a feature wall because having seen so many beautiful bathrooms I worry it will be a tad boring without - yet in a space this tiny all those things could be overkill! On the plus side, even if it is just simple and bright it will definitely be an improvement on what it looked like before. I totally agree with bev- I did my ensuite all fancy wancy with expensive tiles and basins and fixtures and kids bathroom with simple white bright big tiles and simple fixtures.... I so prefer the kids bathroom. It is bright, looks cleaner (even tho they are a hell of a lot messier) and looks bigger. It's just a more enjoyable experience being in a light bright bathroom. Maybe a sky light? Good luck! Haha I do as I preach :) Glad to hear someone else has a TINY ensuite too (ours is 1.8m x 1.8m) and we deliberated for ages on whether to knock out a wall to make the space bigger - now I feel glad that we didn't go that route! Would have meant even more work, time and mess. Your ugly brown tiles, cream cabinetry sounds just like our space - we even have a cream/beige toilet :-/ oh and sink!